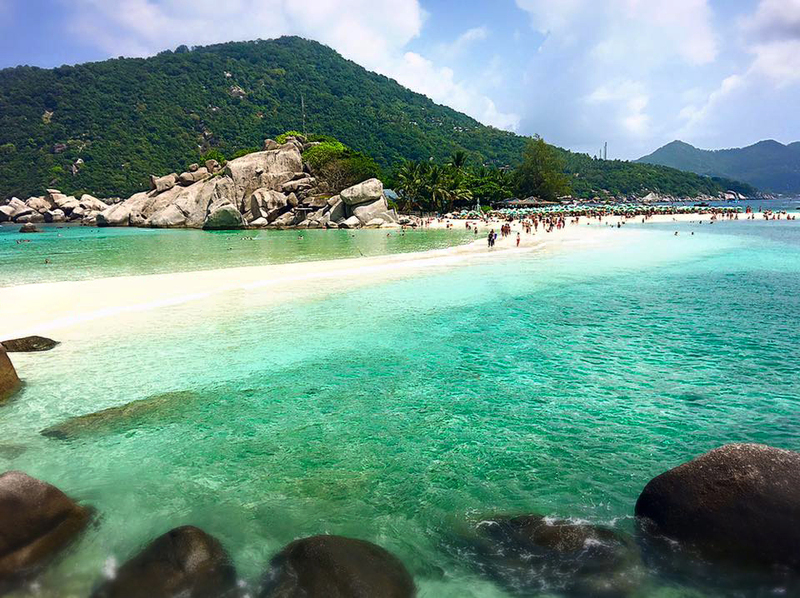 Even though we only spent a few hours at Koh Nang Yuan, we’ve been dreaming about it ever since. To get there, you have to take a ferry to Koh Tao. You should definitely purchase tickets beforehand. (I mean, it’s not the worst thing to get stuck on an island, but you know…) Try your best to get there early to get a seat. The room is equipped with A/C, so it’s comfortable enough. On our way back, though, we weren’t so lucky and were stuck standing/sitting on the floor outside. I was brought back to the memories of being a refugee. Once you land, you’ll be hounded by boaters offering to take you to Koh Tao. We said yes to a random one. Not sure this is the best course of action, but that’s how it happened for us. He took us to Mango Bay for some snorkeling, and then made our way to Koh Nang Yuan. The boater explained how the recent monsoons had destroyed a lot of the corals – that and probably pollutants. I wouldn’t say it was the best place for snorkeling, but it was still fun. Goodness, this island is so dreamy! The water was a perfect amalgamation of blues and greens. The only thing that was unfavorable was the course “sand” on the strip. I don’t know the science on how sand is made, but it felt like this beach didn’t get that memo either. It was predominantly shells so it made walking tough. Bring water shoes because flip flops don’t work well for traipsing through shallow water. We only had enough time to get a quick lunch, then walked up and down that strip. There’s a wonderful overlook for that perfect photo, but it was closed during our visit. If we could do this again, we’d plan for a night’s stay in Koh Tao and spend two days here!